I had the feeling the whole building would be the hotel but it turned out that only a little part of the 'palace' was actually the park inn. So there was no exit to the sea front and the lobby was rather small. The view however was great. So, you're thinking about going to Southend-on-Sea? 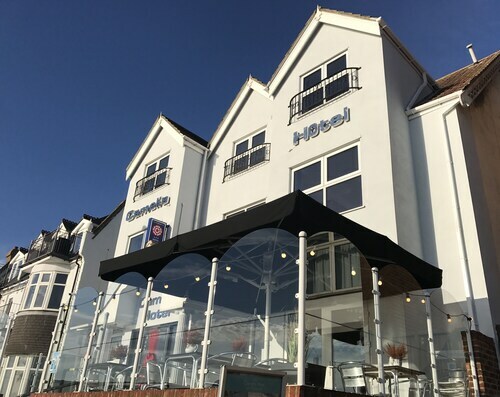 If you'd like to find accommodation that's located near the sights, you can enter your holiday dates and then use the filters beside your hotel search results to find a hotel near the area's attractions such as Southend Pier. 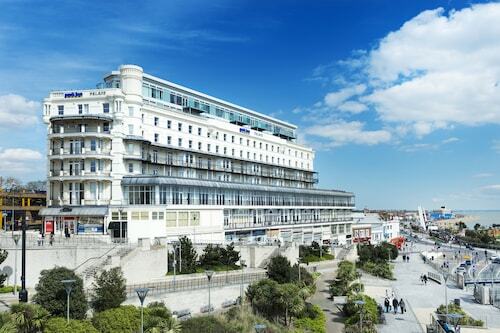 You can choose among 19 Southend-on-Sea hotels and accommodation choices to find a place to stay. 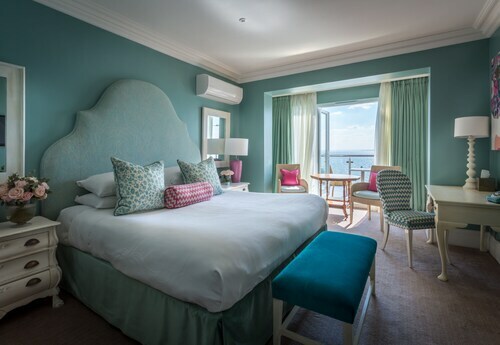 When you're thinking about where you'd like to stay in Southend-on-Sea, you can easily and quickly search ebookers for hotels offering services such as high-speed Internet, a swimming pool or free airport transport. You can take advantage of the filters to narrow down your search for a hotel, so you get the services that are important to you, such as an in-room kitchen or air conditioning. When making plans for your holiday in Southend-on-Sea, you can also use ebookers to look for a convenient flight to Southend-on-Sea (SEN-Southend Municipal) Airport. You can narrow down your search by number of stops, airline or departure time to find the one that'll work best for you. When is the Best Time to Explore Southend-on-Sea? If you're curious when is the best time of year to visit Southend-on-Sea, you might find this info about seasonal weather useful when you are planning your trip. The warmest months in Southend-on-Sea are typically August and July, whereas the coldest months are usually February and January. The months with the most rain are December and September, whereas May and April have the least. From January to March, the average daytime temperature is 11°C and at night it is 1°C. Seasonal average rainfall is 6 mm. If you visit between April and June, you can expect an average temp of 20°C during the day and 4°C at night. Average rainfall during this season is 4 mm. The daytime average temp from July to September is 22°C and the nighttime average is 10°C. Average precipitation for this season is 7 mm. Between October and December, the average temp during the day is 16°C and 3°C at night. Seasonal average rain is 9 mm. The annual rainfall average in Southend-on-Sea is 26 mm. My wife and I spent 3 nights at Ilfracombe House over Christmas Eve / Day and Boxing Day and found the hotel to be very warm and welcoming. 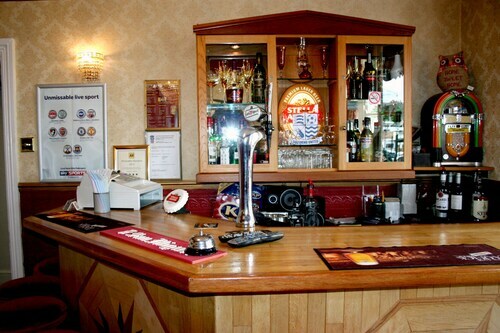 The staff were very friendly and attended to our every need. Our room was spacious, clean and very comfortable. The buffet breakfast was excellent. We booked the 4 course Christmas Day Dinner (very reasonably priced compared to other hotels!) and could even bring our two sons who were not staying at the hotel. It was lovely! There is also a nice bar area where we could enjoy a drink and mingle with the other hotel guests in a very relaxed atmosphere. 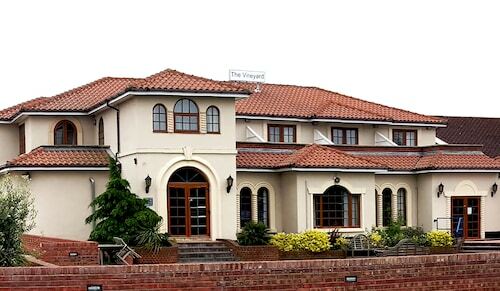 We really enjoyed our stay and would look to book this hotel for future trips to Southend or Westcliff-on-Sea. Highly recommended. I originally booked via E Bookers and there were no rooms with walk in showers left, so I thought I would book a room and ask to use a shower in a free room upon arrival. I am unable to navigate the dangerous shower in a bath combo. I was told by a frosty receptionist if I wanted a shower then I could "upgrade" to a superior room for an extra twenty five pounds per night! So now you have to pay to have facilities a disabled person needs to safely use without breaking their neck. The airport side rooms are nice and clean but I was sure the executive rooms had larger sized beds, the bed we had was not as big as in other hotels. The restaurateur is nice except for whatever time you go into it, be it breakfast, lunch or dinner the staff are always cleaning away the plates and cutlery for the next sitting. It is not relaxing or professional having a nice quiet dinner with staff nosily removing plates and dropping cutlery on the other tables for breakfast the next morning, especially if you are paying restaurant prices. I went for breakfast at 9am on the Monday, there were 3 sausages left and no scrambled eggs , on the Tuesday we went at 9.10am, the same thing. Watch out for the parking charges, unless you get your ticket stamped (which we were not advised of) you end up paying £17 a day airport car park charges. They claim there is a notice outside which neither of us saw, and on at the reception, we did not see that either. Guests need to be told verbally at check in. The guest house was very secure (there is a security briefing! Lol) and there was a slight hiccup about booking the room which I thought was for two people but the owners were not willing to listen and insisted that I pay £20 for the extra guest so make sure you book for the correct amount of guests. Breakfast was fantastic and the room and facilities were of high quality so good value for money. Stayed one night st this hotel. Got a very good on line deal and was very impressed with the hotel. The room was spotless and must have recently been refurbished. Received a warm welcome from staff. Will certainly stay here again. Really enjoyed our stay at "Gleneagles" guest house. Owners and staff very helpful and efficient. Nice quiet location good cooked breakfast- we didn't find one thing to complain about. We are definately going to stay there again. there is very little parking in front of hotel, and if you do secure a place it does cost you. we were supposedly upgraded in our room - didn't look very different in picture from the original one we booked, the room did have clean towels and fairly clean but the bed, wooden bed frame you had to climb over to get out of , the bed squeaked every time you moved!! the room above had squeaky floorboards and a squeaky bed so we could hear them all night and when they got up in the morning whilst we were still in bed. Rooms towards the top not suitable for unfit persons because of stairs. It is not the best place i have ever stayed in and although fair priced i would rather have paid a bit more and had a better place, the overnight stay was not a happy one. Hotel has been updated since last stayed there and rooms were quiet and comfortable. It was very busy with a wedding but we didn't hear the noise when in our room. Very convenient for us as near to family event. 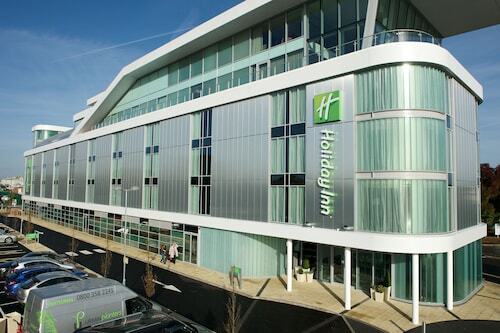 It is not far from Southend and although not the best hotel I've stayed in, I would certainly use again. Can't comment on staff as didn't see them except for checking in and out but polite and efficient then.